Taste of London markets itself as the world’s greatest restaurant festival, and rightly so. 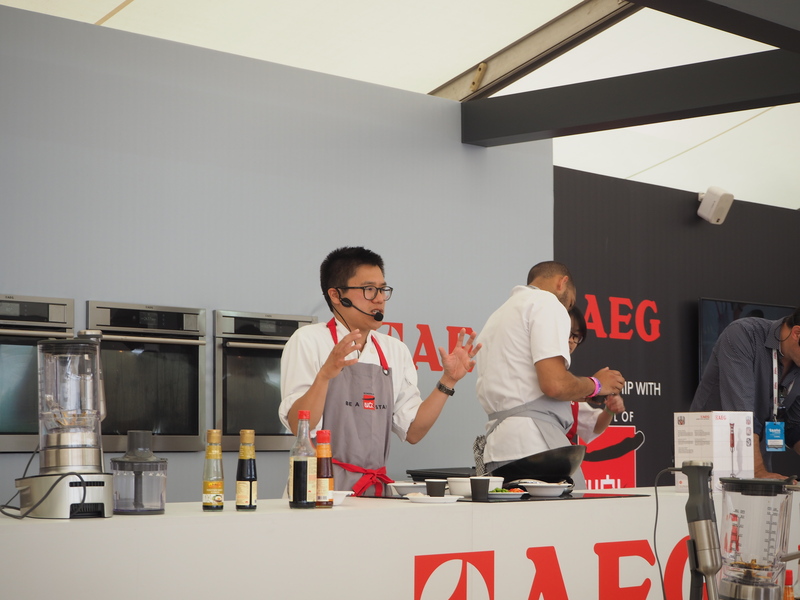 From Masterchef candidates to Michelin-starred chefs, the talent and culinary delights were staggering. 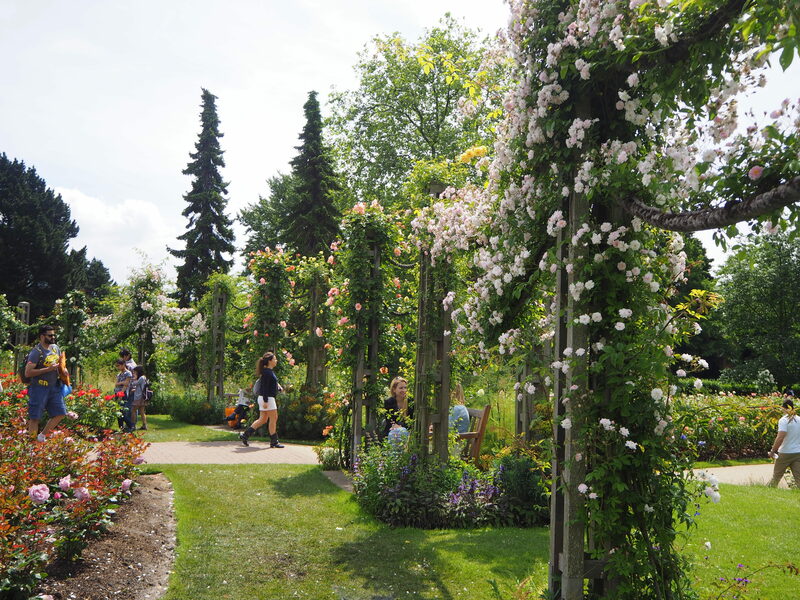 And whilst the weather has been grey and horrible for the past couple of weeks, Sunday yielded sunshine in Regent’s Park, my favourite green space in London! 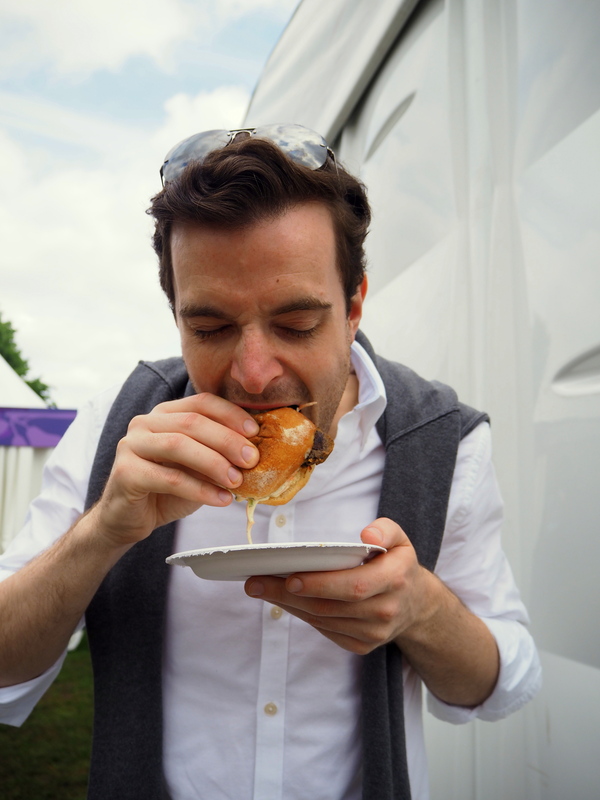 I was incredibly excited this weekend to spend not one, but two days eating to my heart’s content at Taste of London, so I made sure to arrive hungry. Suffice it to say, I left full to the brim! There was so much to soak in, eat, drink, and enjoy, I could go on for pages and pages. But for your sanity and mine, I shall be as short and sweet as I possibly can. Subtle, but beautiful. It melted in my mouth, and left me wanting oh so much more. Slightly overpriced, but that’s what I expect from Sushisamba in general… read more about that here! Dorset crab, brown shrimp, gazpacho ketchup, brioche, Roux at Parliament Square. Fantastic flavours encased in a perfectly soft brioche. A favourite for sure! Smoked bacon, potato, Arlington brown egg yolk, Roux at Parliament Square. A somewhat strangely textured dish, but with an amazing egg yolk inside. ‘Farang Burger’ – Gloucestershire old spot pork belly, shrimp & coconut chilli jam, Thai basil, pickled cucumber, Farang. Absolutely amazing flavours, with just the right amount of spice. A winner all round! Gindara to kani no gyoza, Roka. Good, solid gyoza, with some lovely seafood colours within the casing, but nothing to write home about. The Classic Goan Coconut curry with shrimps, served with organic red unpolished rice, Mr Todiwalas Kitchen. I was upset that the rice was quite overdone in this dish. The shrimp curry was good, but not outstanding, and it by far did not measure up to their kangaroo tikka roll! 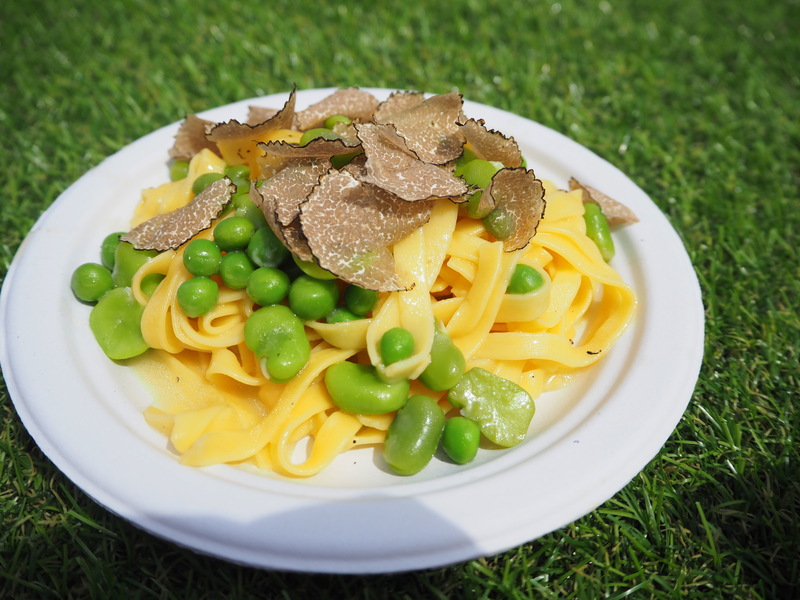 Fettuccine with Grana Padano, broad beans, peas and black truffle, Sartoria. 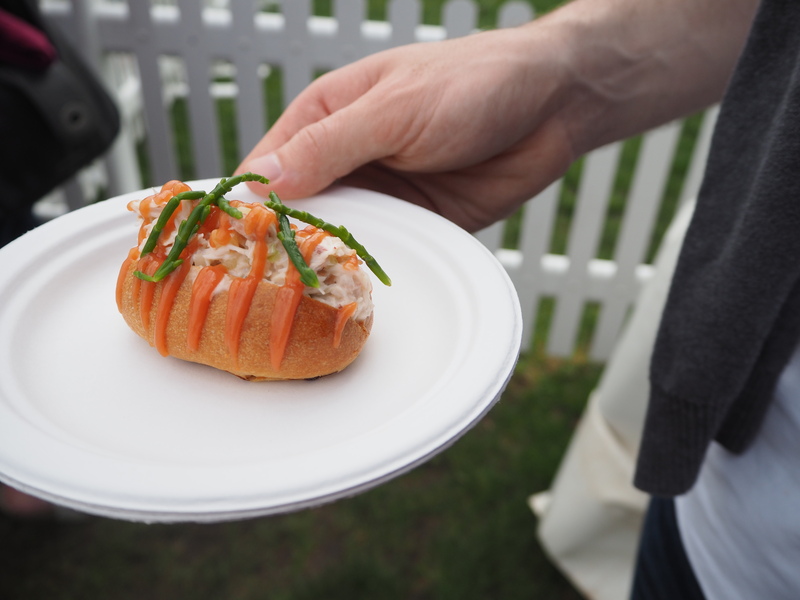 Perhaps the most disappointing dish of the festival, as we’d been looking forward to it for days. 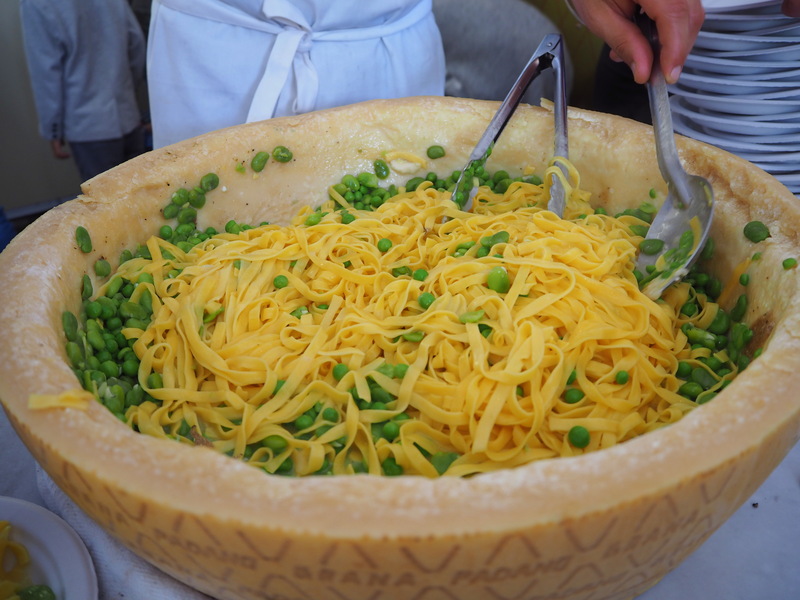 It looks absolutely beautiful, and I loved how they prepared it inside the Parmigiano wheel (see photos below), but it tasted surprisingly ordinary. Trufón – The Big Truffle, Ametsa. Loved the presentation gimmick, with the chocolate sauce bursting the truffle casing beneath. A special mention to the Chocolate pot with salt and olive oil, Gin Mare biscuit from José Pizarro, which was so amazing that… it sold out. Two days running! Absolutely gutted I didn’t get to try it, but apparently it’s on their menu in Broadgate, so a trip there is definitely in order. Particularly after José Pizarro himself apologised profusely to me – what a charmer. With an enormous selection of jamón, chorizo, queso, and more (they even have pata negra, the king of all jamóns), Eatapas were definitely the winner. 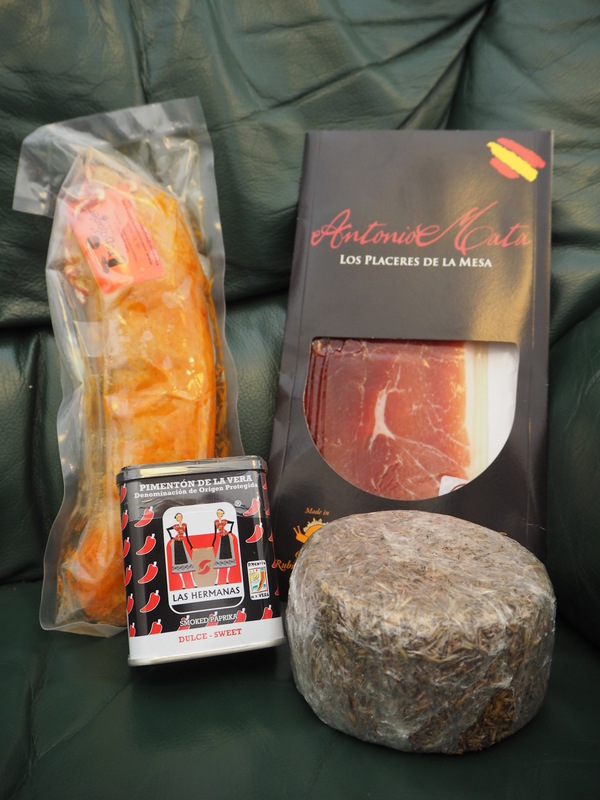 I came home with a bag full of meat and a giant slab of goat’s cheese, and will probably be ordering more from their website soon! 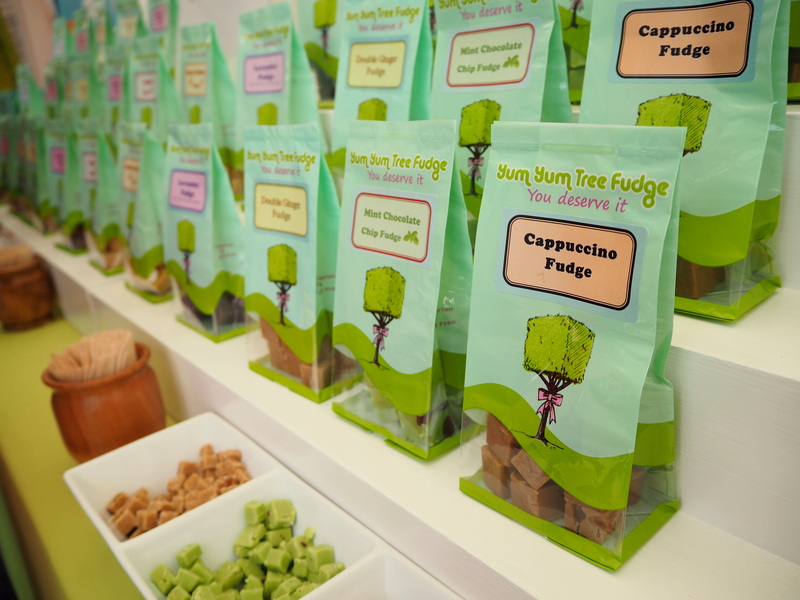 Special mentions: Yum Yum Tree Fudge for their incredible flavours, including diabetic and dairy-free versions. 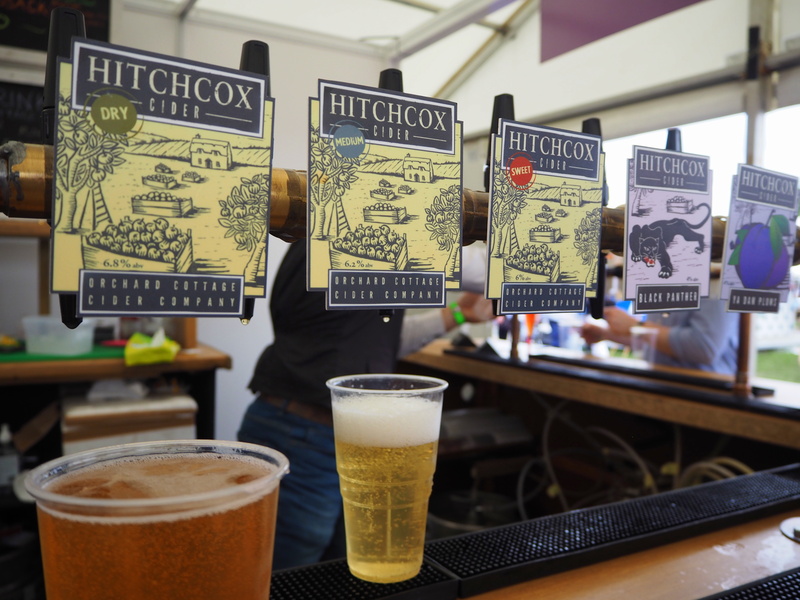 Cider in the Barn, not just for their delicious cider, but for providing hipster hay bales to sit on, from which we spotted the Grano Padano stand and a certain Masterchef candidate (more on that below!). 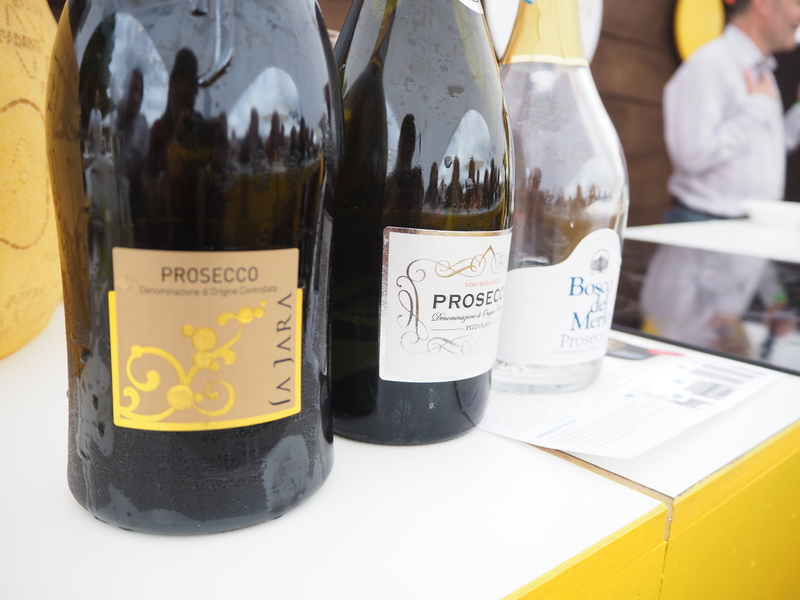 Best drink: DOC Prosecco, of which we tried 3 different kinds and got rather merry. Special mention again to Cider in the Barn. I signed up for the Take Taste Further session with School of Wok (whom I know and love from a cooking class a couple of years ago), but it felt like a big publicity stunt for AEG, Whole Foods, and School of Wok, rather than actual cooking. 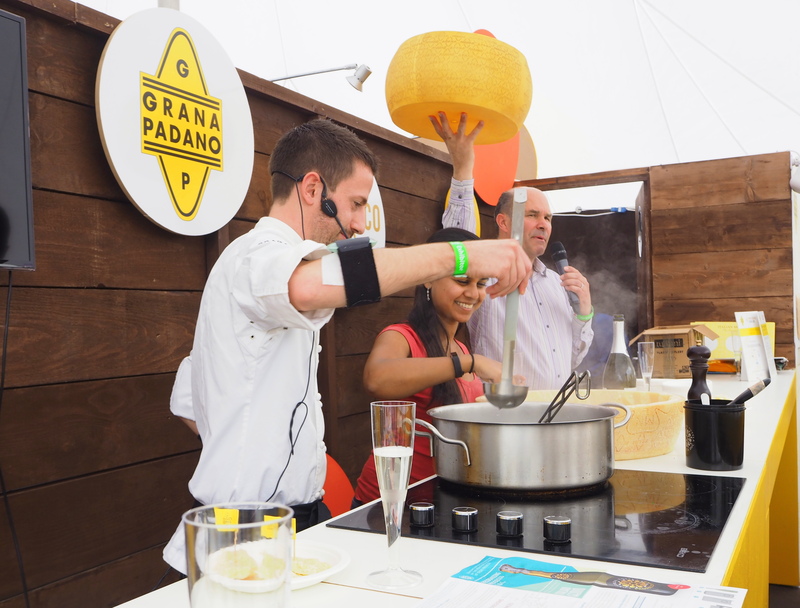 This is why my top experience was another: penne cacio e pepe with a Masterchef finalist! 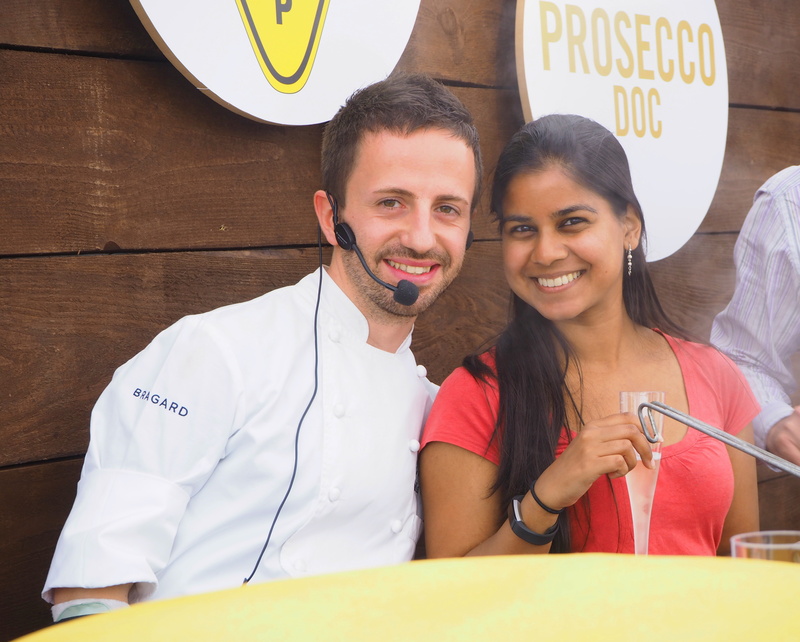 Thanks to my knowledge of cacio e pepe from my trip to Rome last year, and to my embarrassment and delight, I was called up to help prepare the dish (and by prepare I mean stir, whilst sipping Prosecco)! I loved the experience, and cooking alongside Danilo was great fun after seeing him on Masterchef last year. I wish his cooking weren’t just confined to the Italian Embassy – rest assured that when he opens his own restaurant, I’ll be the first in line. 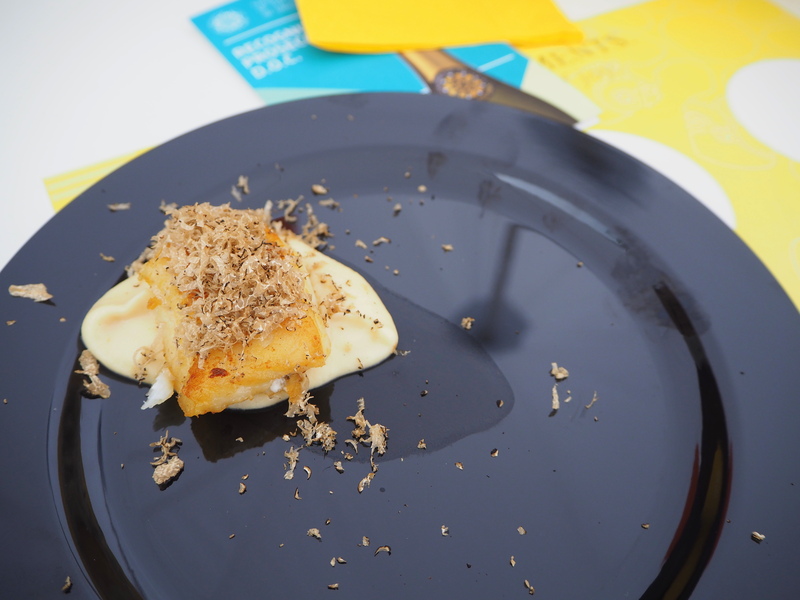 He even gave us a little bonus dish at the end, a wee plate of turbot with truffle shavings! Here are some more photos from my weekend! 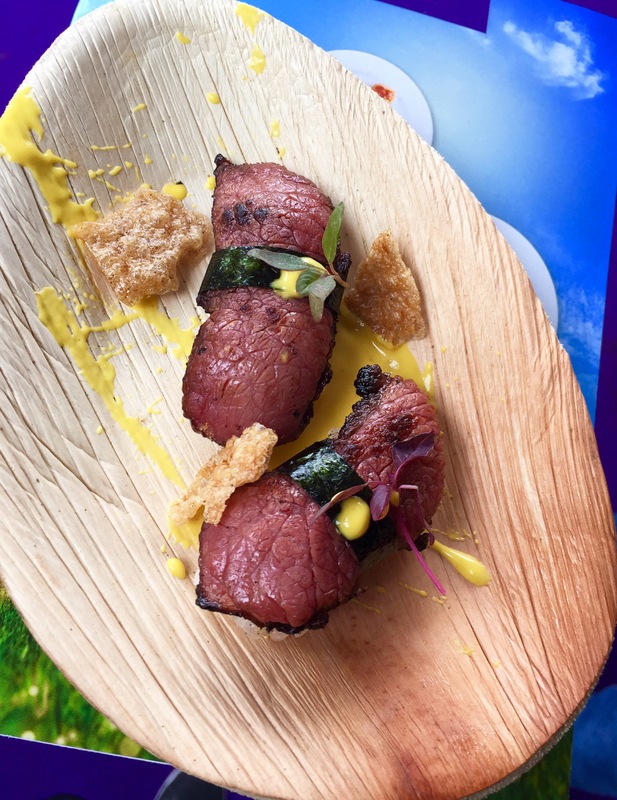 I was invited to Taste of London by Eatapas, but my views on their products and the festival are entirely my own (taste them, and you’ll know why!). 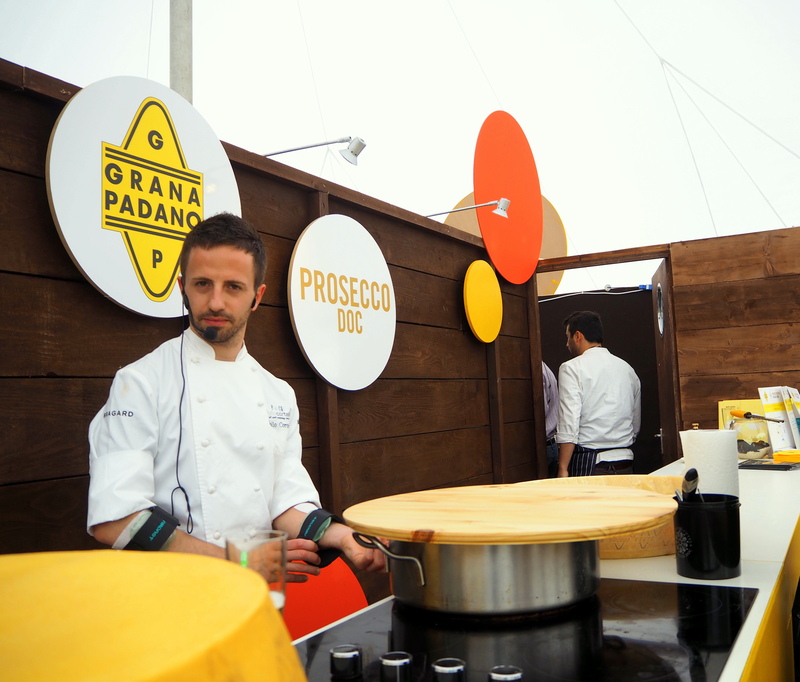 I loved Danilo’s masterclass too, great dishes… Just to point out though, that Sartoria’s dish also used Grana Padano, not Parmigiano!